Windows Mobile allows user to tweak and configure the working of the device according to user’s preference by changing registry entries’ values or setting registry keys. To edit the Windows Mobile registry, a registry editor is required. PHM Registry Editor is a popular choice, but it has not been update for years, and requires user to install directly with .CAB on device instead of using desktop installer. Beside, editing on the small LCD screen of mobile device and using just stylus or keypad may be inconvenient. So there is Mobile Registry Editor is a freeware registry editor that is good desktop based alternative for PHM Registry Editor. Similar to CeRegEditor, Mobile Registry Editor can be used to remotely edit the registry of Pocket PC, Smartphone and Windows Mobile device, conveniently using desktop keyboard and mouse. Mobile Registry Editor is pretty similar to Windows Registry Editor (RegEdit), but with extra features such as favorites, value size, column sorting, ability to create, delete or rename registry keys and values, and copy key name to clipboard memory. 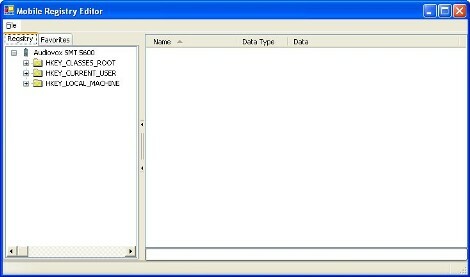 Download Mobile Registry Editor (MobileRegistryEditor.zip) (no longer available). Mobile Registry Editor requires Microsoft .NET Framework 1.1 to run (see how to install .NET Framework 1.1. in Windows 10 / 8.1 / 8 / 7 / Vista).